I published some fake news last post on the inaugural Australian Camino Festival. I indicated that it was a joint effort between Tony Jacques, and Rowan & Margaret at Glenella. In fact it was Rowan’s baby from the get-go – his brainchild and his and Margaret’s organisation behind it all. Rowan had noticed how Parkes, a small town further west, had created a huge annual festival celebrating Elvis Presley – and he twigged that maybe he could do the same thing with a Camino festival in Blackheath, in the Blue Mountains behind Sydney. 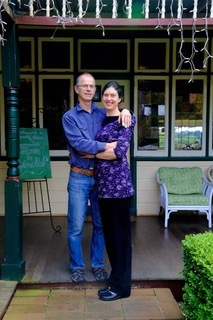 The pilgrim dinners that Tony and Ce had established, and are always held at Glenella, had become a big hit, and Rowan thought that maybe he could do something larger, such as a four day festival and expo that’s Camino-centric. His instincts were sound because already, even a couple of weeks before it kicks off, it looks like it’s going to be a big success. Registrations are strong – and they’ve run out of speaking slots. My apologies to all concerned for the fake news. I’d made an assumption, and I should know from my previous incarnation as a journalist that you never make assumptions. I seem to have found part 1 of your talk with the lovely Dan Mullins pilgrim in his great podcast. Hi Julian – yes, part two next week. I’m going to do a blog on it on the weekend. Dan is doing good work with his podcast. I hope you enjoy it! Met a pilgrim in his 90s today, whose Camino was in the 90s, lovely gentleman. Julian – that’s extraordinary. That’s a hell of a walk irrespective of age, much less someone who is in his 90s. Amazing! Congratulations to Rowan for dreaming up the idea of this most significant and special event, and also to Margaret and Tony for their involvement. They’re a terrific team and all the time and effort they’ve put into organising the Festival will bring its rewards in spades. Our Australian pilgrim community is so blessed to have Rowan, Margaret, Tony (and of course Ce) as a major part of our community. They all take our community to the next level of goodwill and connection. I’ve just listened to Part 1 of your interview with Dan – it’s an absolute cracker! I loved every minute. I’m looking forward to reading your blog post on it on the weekend. No worries Bill – I hope that the film is coming along really, really well and that all those long hours will bring rewards of every kind. The weekend is going to be so wonderful – the programme looks terrific. I look forward to seeing your post on Dan and the podcasts – Part 1 was totally brilliant!